Havaianas lets you travel in personalized style this summer at Make Your Own Havaianas 2011 from May 12 to 16 at the Rockwell Tent. Make Your Own Havaianas is your passport to mixing and matching travel-inspired limited edition soles, straps, and pins. 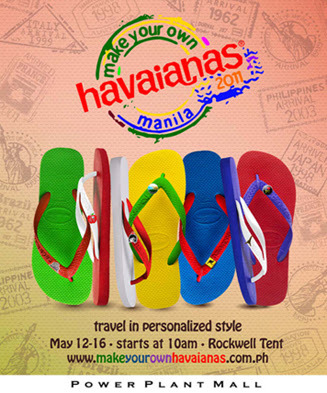 Be a jetsetter and a trendsetter at the same time with Make Your Own Havaianas 2011, May 12 to 16 at the Rockwell Tent, event starts at 10am. Visit http://myoh.havaianasphilippines.com/ for more details.